Bob Richardson, the author of our previous Innerleithen publication, Innerleithen Shops has written a new book, ‘Snippets & Photos About Old Innerleithen’. He’s dipped into other publications about Innerleithen, some of which are long out of print, gleaned pieces from the local newspaper, St Ronan’s Standard, but he’s also talked to local people and I know from experience that can be a rich source of information if only you can get them to start talking. 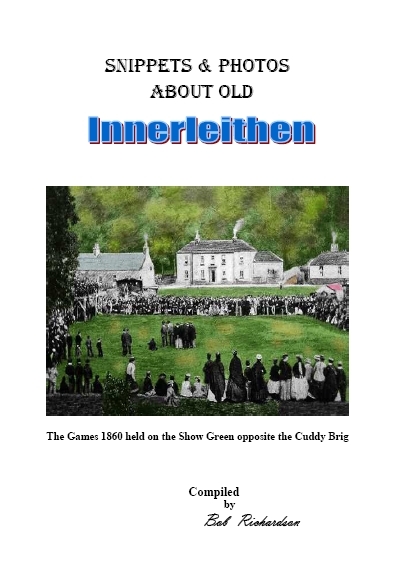 Innerleithen Shops showed that in the 19th and early 20th centuries, Innerleithen was a busy place for commerce, however, this new book shows that it was a busy place in many more ways. Mr Richardson covers the history of Innerleithen as well as churches, schools, old towers, mills, rivers and pools and associated constructions, roads, bridges, inns, hotels, a curling rink, the post office, the library, a few shops, two political clubs, the gas works, sports clubs and sporting occasions, slaughter houses, blacksmiths, the plague, the Masonic Lodge, the town hall, shooting ranges, telephone exchanges and laundries. There’s also a timeline, mainly from 1825 to 1975, a list of Innerleithen place names and their locations; descriptions of two walks, one along Leithen Road in 1900, the other up The Strip (date not stated); and an index. The 56 page paperback has 18 colour illustrations, including one on the front cover. I’m astonished by the number of schools that there were in Innerleithen and especially that the parish school (which later became Leithenside School) was established in 1737. Even more surprising was that another school, Innerleithen Academy, charged fees of £35 per pupil in 1846, more than a farm hind and his family could expect to earn in a year. I’m enthralled by the descriptions of the walks, partly because although you can see on old maps where the buildings were and using valuation rolls (after 1855) see who the occupants were, there’s no way to get the local colour unless it’s been recorded. Of course, in 56 pages, you can’t expect a comprehensive history of Innerleithen, on the other hand, books that set out to be comprehensive are often boring. This book isn’t at all boring and for me, an occasional day visitor to Innerleithen, it’s fascinating to read and see how the town has changed over the years. There’s something for every interest here and it’s a “must have” for every St Ronanite, no matter where they’re currently living. The book is priced at £5 plus postage and can be purchased at our premises or by choosing the appropriate delivery option and pressing the button below.